We describe a minimally invasive alternative approach in a patient with infected hepatic cyst to stabilize the patient before definitive surgery. 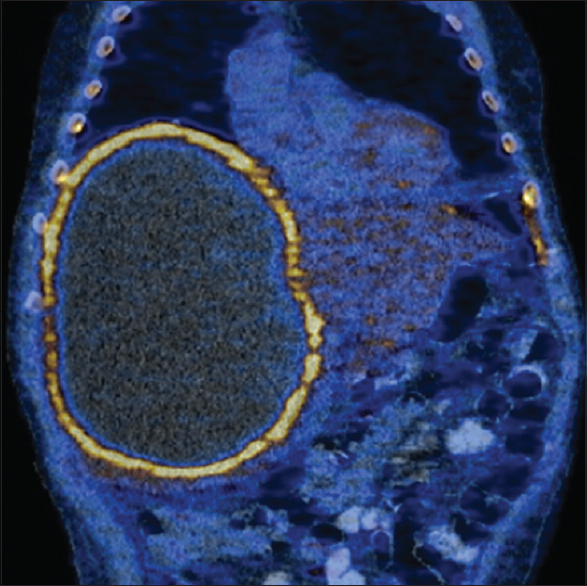 A 58-year-old man presented with fever and hypotension after 2 weeks of asthenia, chills, weight loss, slight abdominal pain, and a previous asymptomatic simple hepatic cyst. On ultrasound, a giant heterogeneous hepatic cyst with thick wall was noted. A positron emission tomography-computed tomography scan was indicated and demonstrated high uptake (standardized uptake value = 7.6) in the wall of the cyst, suggestive of infection. He underwent percutaneous drainage guided by the tomography. A 12 Fr drain was positioned inside the collection and 5 L of purulent material was aspirated from the cyst, and at day 12th, surgical resection was performed. Histopatological analysis confirmed a simple biliary cyst. The patient remains asymptomatic on 1-year follow-up. Percutaneous drainage before surgical treatment allowed the definitive approach to be performed with the patient in better clinical conditions. Simple hepatic cysts are common in the population, with incidence ranging from 3% to 10%., The cysts can be divided into congenital, neoplastic, inflammatory, and traumatic. The most frequent are congenital and include simple cysts and polycystic liver disease. Small simple cysts are generally asymptomatic and do not require specific treatment. However, giant cysts may present with compressive symptoms, bleeding, and infection,, and the treatment is recommended in symptomatic patients. Among the possible complications, infection is one of the most feared one and has a mortality up to 19%. However, its mortality showed a significant reduction due to the early diagnosis and the introduction of early therapeutic measures and improvement of intensive care. The introduction of intravenous antibiotic therapy is one of the most important measures to be undertaken; however, in large abscesses, its inclusion as sole therapy is insufficient for etiological control., In this way, more invasive measures should be adopted. The options include minimally invasive alternatives such as aspiration, percutaneous drainage, or fenestration; however, resection of the cyst wall through open surgery is considered the definitive therapy of choice. We describe a minimally invasive alternative approach in a patient with infected hepatic cyst to stabilize the patient before definitive surgery. A 58-year-old man presented to our hospital with fever and hypotension after 2 weeks of asthenia, chills, weight loss, and slight abdominal pain. His medical history included a longstanding asymptomatic simple hepatic cyst and a recent infection of the upper airways. His admission laboratory tests showed anemia, monocytosis, and high levels of C-reactive protein. On ultrasound [Figure 1], a giant heterogeneous cyst with thick wall was noted in the right hepatic lobe, 6 cm larger than the previously reported. A positron emission tomography-computed tomography scan [Figure 2] demonstrated high uptake (standardized uptake value = 7.6) in the wall of the cyst, suggestive of infection. After multidisciplinary discussion between the teams of interventional radiology, clinical hepatologists, and gastro-surgeons, it was opted to perform a percutaneous drainage guided by tomography, and after clinical-laboratory stabilization, it was opted to implement an elective surgical approach of the hepatic cyst. CT-guided percutaneous drainage was performed under intravenous sedation. 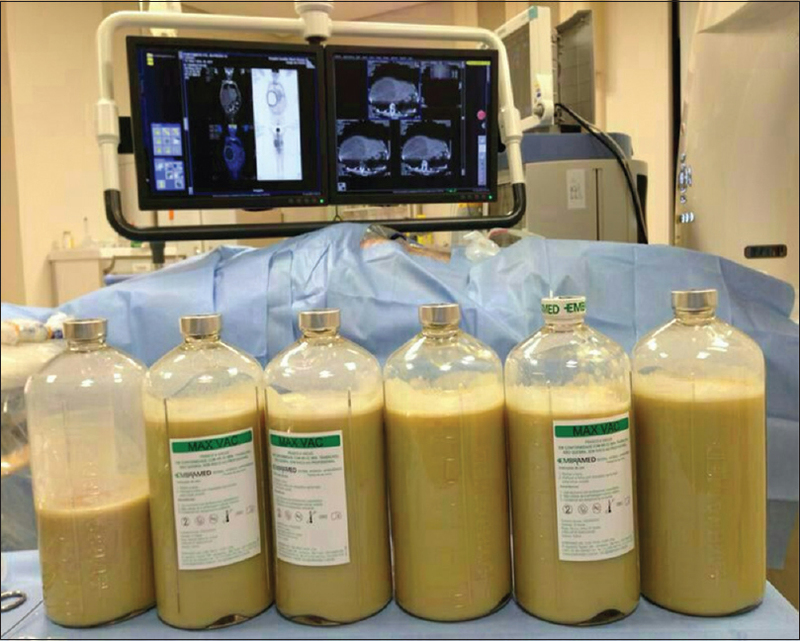 A 12 Fr Dawson–Mueller Drainage Catheter (Cook Medical, Bloomington, IN, USA) was positioned inside the collection and 5 L of purulent material was aspirated from the cyst [Figure 3]. Samples of cyst material and tracheal secretion were sent to culture, as well as two samples of blood cultures. Cultures were all negative, except for tracheal aspirate which demonstrated grown of Enterococcus faecalis. Vancomycin was started, and at day 12th, surgical resection was performed. Histopathological analysis confirmed a simple biliary cyst. The patient had been discharged 8 days later and remains asymptomatic on 1-year follow-up. 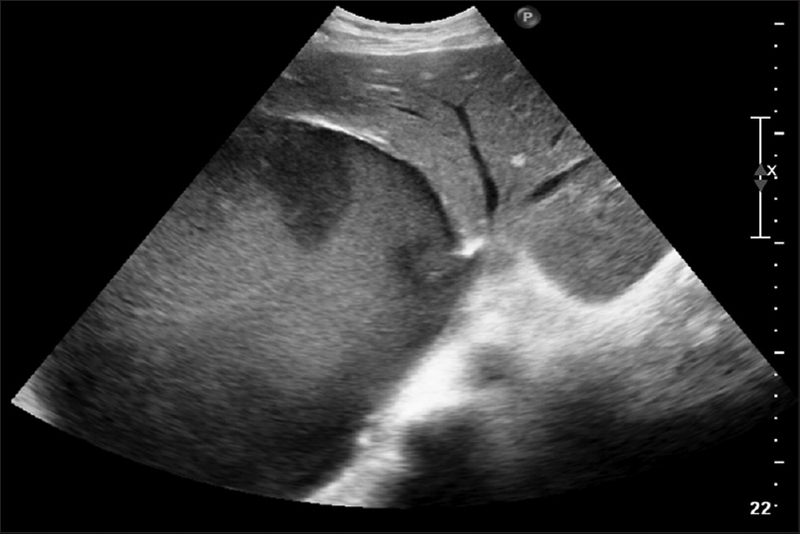 Simple hepatic cysts are most frequent asymptomatic and often the diagnosis is made by incidental finding of abdominal imaging for another cause., Symptoms when present are usually due to mass effect or secondary infection from mild symptoms to acute peritonitis by the rupture of pyogenic liver abscess into the abdominal cavity. Despite the high mortality rate associated with hepatic pyogenic abscess, the development of minimally invasive techniques together with the improvement of intensive care reduced the mortality associated with this pathology., The association of percutaneous drainage with intravenous antibiotic therapy proved to be a safe option. Tan et al. showed that surgical drainage of hepatic abscesses greater than 5 cm showed a better clinical evolution in terms of need for re-intervention and success rate of the procedure and should be considered as the first line of therapy. Although the conventional surgical approach is still considered the definitive therapy of choice, excessive manipulation of the liver in a patient with symptomatic hepatic abscess may lead to severe bacteremia, exposing the patient to greater anesthetic risk. We describe a case in which percutaneous drainage before surgical treatment allowed the definitive approach to be performed with the patient in better clinical conditions. Asuquo M, Nwagbara V, Agbor C, Otobo F, Omotoso A. Giant simple hepatic cyst: A case report and review of relevant literature. Afr Health Sci 2015;15:293-8. Willems K, Monsivais S, Vassaur H, Buckley FP 3rd. Single-incision laparoscopic management of a giant hepatic cyst. J Surg Case Rep 2015;2015. pii: rjv073. Tucker ON, Smith J, Fenlon HM, McEntee GP. Giant solitary non-parasitic cyst of the liver. Ir J Med Sci 2005;174:60-2. Garcea G, Rajesh A, Dennison AR. Surgical management of cystic lesions in the liver. ANZ J Surg 2013;83:516-22. Du ZQ, Zhang LN, Lu Q, Ren YF, Lv Y, Liu XM, et al. Clinical charateristics and outcome of pyogenic liver abscess with different size: 15-year experience from a single center. Sci Rep 2016;6:35890. Ahmed S, Chia CL, Junnarkar SP, Woon W, Shelat VG. Percutaneous drainage for giant pyogenic liver abscess – is it safe and sufficient? Am J Surg 2016;211:95-101. Hakyemez IN, Sit M, Aktas G, Tas T, Mengeloglu FZ, Kucukbayrak A, et al. A case of giant hepatic hydatid cyst infected with Morganella morganii and the literature review. Case Rep Gastrointest Med 2012;2012:591561. Tan YM, Chung AY, Chow PK, Cheow PC, Wong WK, Ooi LL, et al. An appraisal of surgical and percutaneous drainage for pyogenic liver abscesses larger than 5 cm. Ann Surg 2005;241:485-90.